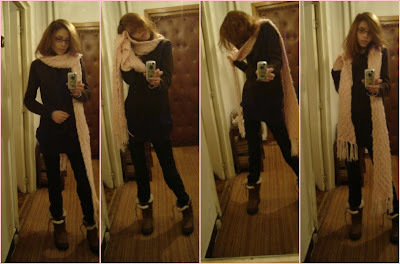 I got a little silly today, making fun with this long scarf. I can't wear the scarf like this on the street (I really have to put a jacket on) plus it's way too heavy and all, but mark my words: I will eventually find a way to wear a huge bow in the near future. I had some past attempts of sewing different shaped materials and beads onto old blouses or sweaters and turn them into little pieces of art. And I've also tried knitting. I've somehow managed to make a 2 meters long scarf with pockets on the sides; I promise I'll search it and take some photos for you, if you wanna see it. Anyway, this happened 3 or 4 years ago, and haven't knitted since then, but it was a fun experience. I really like the scarf. Especially in the way you wore it as a bow. It's totally unexpected and grunge chic! Very cool, I like how you wore the scarf as a bow. I am going to try that.